HONG KONG — Ten paintings by noted Vietnamese artist Lê Phổ (1907-2001) were sold at high prices at an auction sale held by Christie’s Hong Kong on November 26. 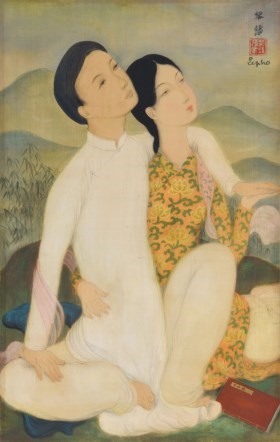 Diễm Tình (Idylle), made on silk, drawn in the 1940s, was sold for the highest amount at HK$2,000,000 (US$256,308), while Cô Gái Uống Trà (The Lady with Teacup) was sold for HK$1,000,000 and Cô gái Việt (Vietnamese lady) for HK$725,000. 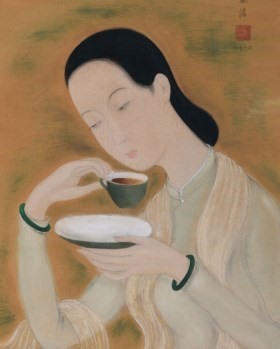 Seven works of artist Mai Trung Thứ (1906-1980) were also sold at high prices, including Chuyện Dân Gian (Fairy Tale) for HK$812,500, Khăn Choàng Vàng (The Yellow Scarf)) for HK$437,500 and Cô Gái Trẻ Châu Âu trong Vườn Hoa Nhật (Young European Lady in a Japanese Garden) for HK$375,000.